Imagine how excited I was to see that Beautiful Britain magazine is offering a free sample issue to everyone who signs up. They also have back issues on their website available for viewing as .pdf files. 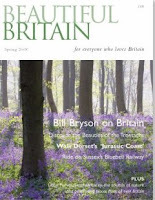 I read a charming interview with the author Bill Bryson about his work with the Campaign to Protect Rural England. I'm anxiously awaiting my sample issue, but I feel another subscription coming on . . . I finished reading Ambulance Girl: How I Saved Myself By Becoming an EMT by Jane Stern over the weekend, and it was very entertaining. I enjoyed the first part of the book, when Stern was attending the EMT training courses, much more than the second part of the book when she actually was an EMT. It was fascinating to read about her experiences, and how becoming an EMT at the age of 52 helped to pull her out of a chronic depression. Still, I marvel at how someone who was fearful and anxious in general, and claustrophobic in particular thought it would be a good idea to become an EMT. Dealing with blood, stress and terrifying situations on a daily basis, not to mention having to ride in a small, boxy, enclosed ambulance as part of your job description would seem to override any impulse to follow through with the training. Yet Stern perserveres, and although she has plently of missteps along the way, she ends up becoming an accepted member of the local rescue team. Although I have to wonder at how this was achieved, especially when, on her first call as a certified EMT, she attends an elderly lady who has fallen and broken her hip and manages to kick the patient in the hip!